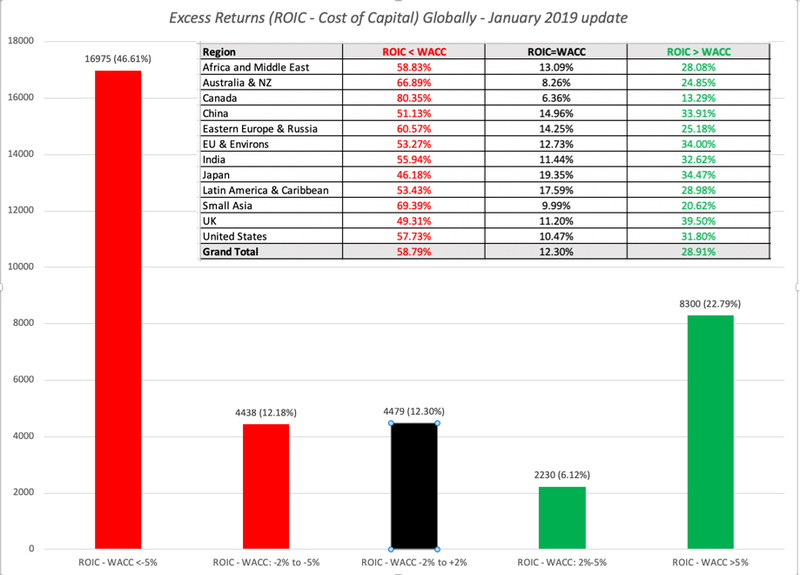 Musings on Markets: January 2019 Data Update 6: Profitability and Value Creation! In my last post, I looked at hurdle rates for companies, across industries and across regions, and argued that these hurdle rates represent benchmarks that companies have to beat, to create value. That said, many companies measure success using lower thresholds, with some arguing that making money (having positive profits) is good enough and others positing that being more profitable than competitors in the same business makes you a good company. In this post, I will look at all three measures of success, starting with the minimal (making money), moving on to relative judgments (and how best to compare profitability across companies of different scales) and ending with the most rigorous one of whether the profits are sufficient to create value. You may start a business with the intent of meeting a customer need or a societal shortfall but your financial success will ultimately determine your longevity. Put bluntly, a socially responsible company with an incredible product may reap good press and have case studies written about it, but if it cannot establish a pathway to profitability, it will not survive. But how do you measure financial success? 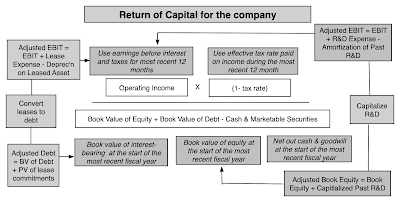 In this portion of the post, I will start with the simplest measure of financial viability, which is whether the company is making money, usually from an accounting perspective, then move the goal posts to see if the company is more or less profitable than its competitors, and end with the toughest test, which is whether it is generating enough profits on the capital invested in it, to be a value creator. The key, no matter which claim holder perspective you adopt, is to stay internally consistent. Thus, you can discount cash flows to equity (firm) at the cost of equity (capital) or compare the return on equity (capital) to the cost of equity (capital), but you cannot mix and match. The Minimal Test: Making money? The push back, even on this simplistic measure, is that just as one swallow does not a summer make, one year of profitability is not a measure of continuing profitability. Thus, you could expand this measure to not just look at average income over a longer period (say 5 to 10 years) and even add criteria to measure sustained profitability (number of consecutive profitable years). No matter which approach you use, you still will have two problems. The first is that because this measure is either on (profitable) or off (money losing), it cannot be used to rank or grade firms, once they have become profitable. The other is that making money is only the first step towards establishing viability, since the capital invested in the firm could have been invested elsewhere and made more money. It is absurd to argue that a company with $10 billion in capital invested in it is successful if it generates $100 in profits, since that capital invested even in treasury bills could have generated vastly more money. As I noted in my section on claimholders above, you would use net margins to measure profitability to equity investors and operating margins (before or after taxes) to measure profitability to the entire firm. 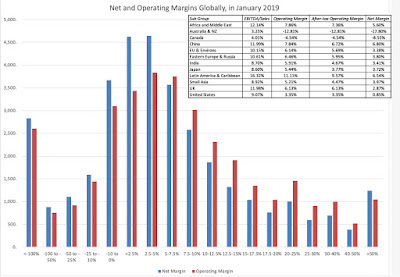 Gross and EBITDA margins are intermediate stops that can be used to assess other aspects of profitability, with gross margins measuring profitability after production costs (but before selling and G&A costs) and EBITDA margins providing a crude measure of operating cash flows. 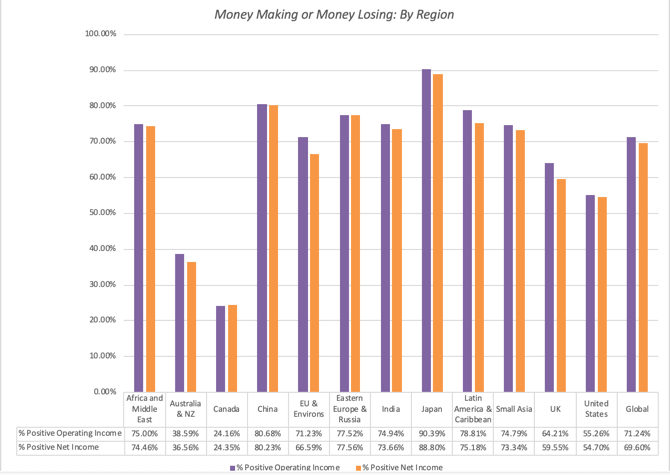 The regional comparisons of margins are difficult to analyze because they reflect the fact that different industries dominate different regions, and margins vary across industries. 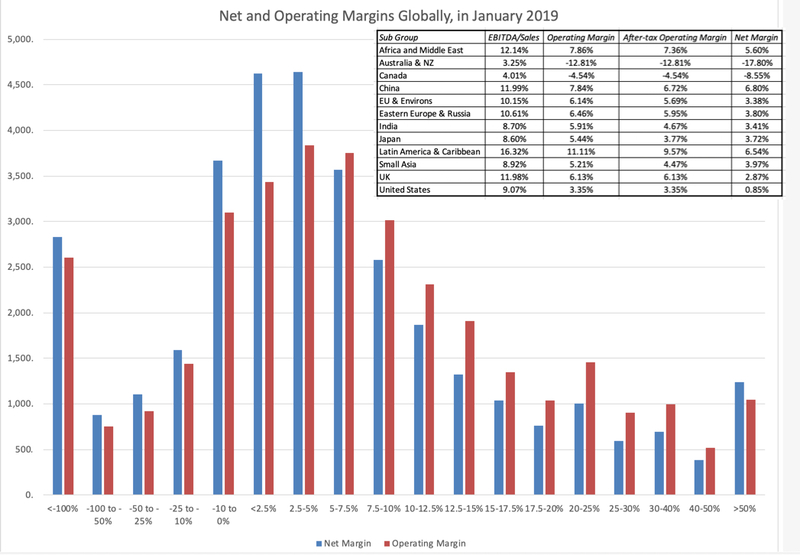 You can get the different margin measures broken down by industry, in January 2019, for US firms by clicking here. You can download the regional averages using the links at the end of this post. Profits: The profit measures we have for companies reflect their past, not the future, and even the past measures vary over time, and for different proxies for profitability. You could look at net income in the most recent twelve months or average net income over the last ten years, and you could do the same with operating income. Since value is driven by expectations of future profits, it remains an open question whether any of these past measures are good predictors. Invested Capital: You would think that a company would keep a running tab of all the money that is invested in its projects/assets, and in a sense, that is what the book value is supposed to do. However, since this capital gets invested over time, the question of how to adjust capital invested for inflation has remained a thorny one. 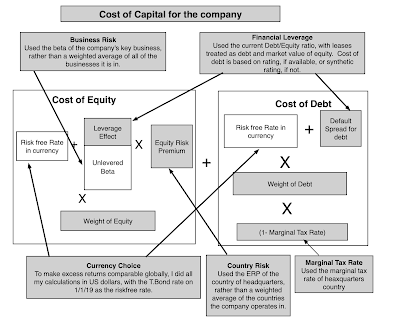 If you add to that the reality that the invested capital will change as companies take restructuring charges or buy back stock, and that not all capital expenses finds their way on to the balance sheet, the book value of capital may no longer be a good measure of capital invested in existing investments. Opportunity Cost: Since I spent my last post entirely on this question, I will not belabor the estimation challenges that you face in estimating a hurdle rate for a company that is reflective of the risk of its investments. 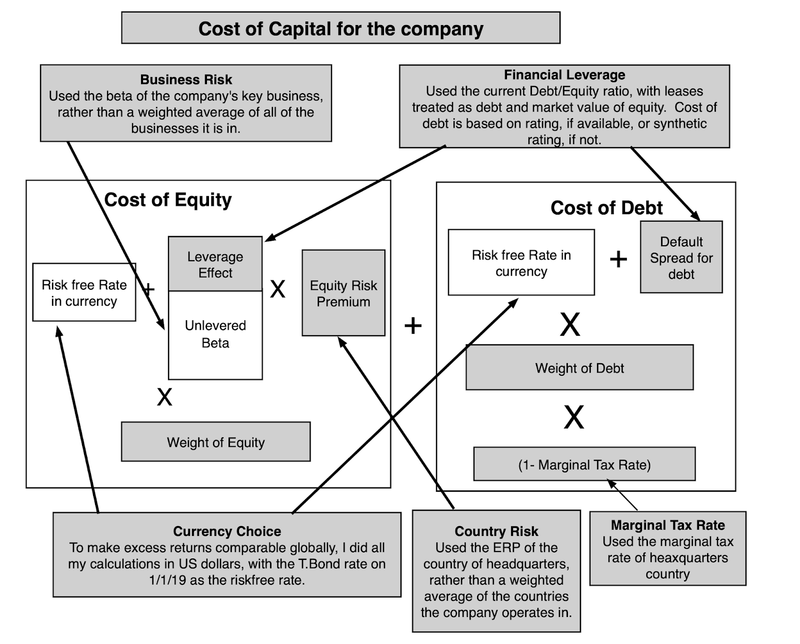 In a perfect world, you would scale your expected cashflows in future years, adjusted for time value of money, to the correct amount of capital invested in the business and compare it to a hurdle rate that reflects both your claim holder choice (equity or the business) but also the risk of the business. In fact, that is exactly what you are trying to do in a good intrinsic or DCF valuation. I am aware of the limitations of this comparison. First, I am using the trailing twelve month operating income as profits, and it is possible that some of the firms that measure up well and badly just had a really good (bad) year. It is also biased against young and growing firms, where future income will be much higher than the trailing 12-month value. Second, operating income is an accounting measure, and are affected not just by accounting choices, but are also affected by the accounting mis-categorization of lease and R&D expenses. 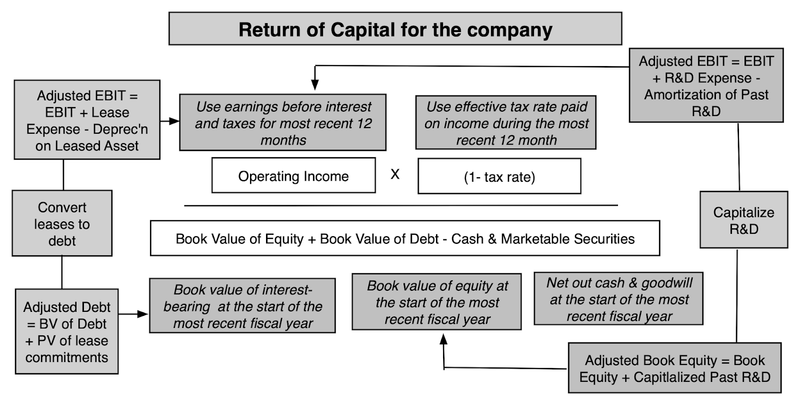 Third, using book value of capital as a proxy for invested capital can be undercut by not only whether accounting capitalizes expenses correctly but also by well motivated attempts by accountants to write off past mistakes (which create charges that lower invested capital and make return on capital look better than it should). In fact, the litany of corrections that have to be made to return on capital to make it usable and listed in this long and very boring paper of mine. Notwithstanding these critiques, the numbers in this graph tell a depressing story, and one that investors should keep in mind, before they fall for the siren song of growth and still more growth that so many corporate management teams sing. 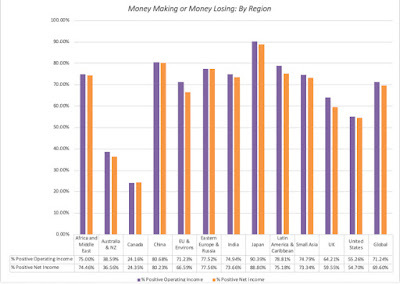 Globally, approximately 60% of all firms globally earn less than their cost of capital, about 12% earn roughly their cost of capital and only 28% earn more than their cost of capital. There is no region of the world that is immune from this problem, with value destroyers outnumbering value creators in every region. Growth is a mixed blessing: In 60% of companies, it looks like it destroys value, does not add to it. While that proportion may be inflated by the presence of bad years or companies that are early in the life cycle, I am sure that the proportion of companies where value is being destroyed, when new investments are made, is higher than those where value is created. Value destruction is more the rule than the exception: There are lots of bad companies, if bad is defined as not making your hurdle rate. In some companies, it can be attributed to bad managed that is entrenched and set in its ways. 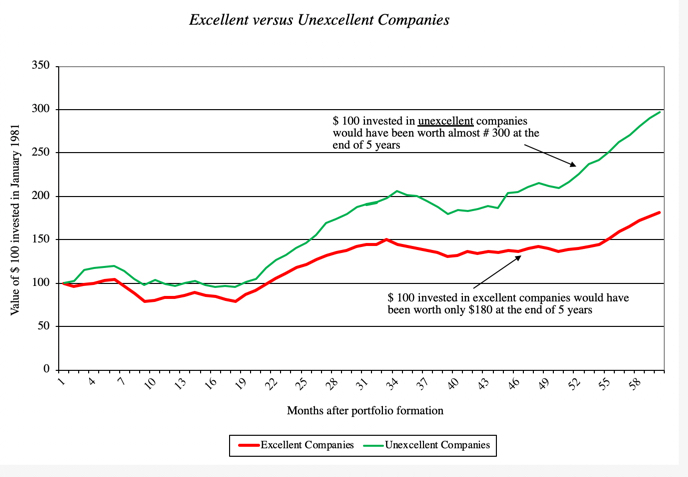 In others, it is because the businesses these companies are in have become bad business, where no matter what management tries, it will be impossible to eke out excess returns. You can see the variations in excess returns across industries, for US companies, by clicking on this link, but there are clearly lots of bad businesses to be in. The same data is available for other regions in the datasets that are linked at the end of this post. The paper is dated, but its results are not, and they have been reproduced using other categorizations for good and bad firms. Thus, investing in the most admired firms generates worse returns for investors than investing in the least admired and investing in popular (with investors) firms under performs investing in unpopular ones. While these results may seem perverse, at first sight, that bad (good) companies can be good (bad) investments, it makes sense, once you factor in the expectations game. Finally, on the corporate governance front, I feel that we have lost our way. Corporate governance laws and measures have focused on check boxes on director independence and corporate rules, rather than furthering the end game of better managed companies. From my perspective, corporate governance should give stockholders a chance to change the way companies are run, and if corporate governance works well, you should see more management turnover at companies that don't earn what they need to on capital. 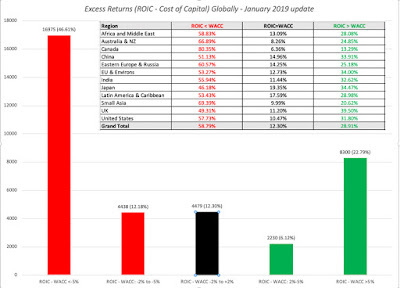 The fact that six in ten companies across the globe earned well below their cost of capital in 2018, added to the reality that many of these companies have not only been under performing for years, but are still run by the same management, makes me wonder whether the push towards better corporate governance is more talk than action.